The writer of Ecclesiastes once said, “Be warned my son... of making many books there is no end, and much study wearies the body” (Eccl.12:12). That could certainly be said about books on marriage. The market sometimes seems glutted with them. Occasionally however, one rises above the fray to bring a needed breath of fresh air to an overcrowded library. Such is ‘Marriage Matters’ by Tanya Ferdinandusz. Four things make this little work a treasure box worth opening. First, it’s in lock-step with the Bible. In an age when marriage is becoming anything one decides to call it, Ferdinandusz anchors virtually every page of her book to truth that is mined from God’s unchanging word. The drifting world of marriage desperately needs such mooring and she doesn’t disappoint. Secondly, it’s practical. Formatted in fifty-two short readings, it provides us with scores of timely real-world applications for the daily bread of married life. 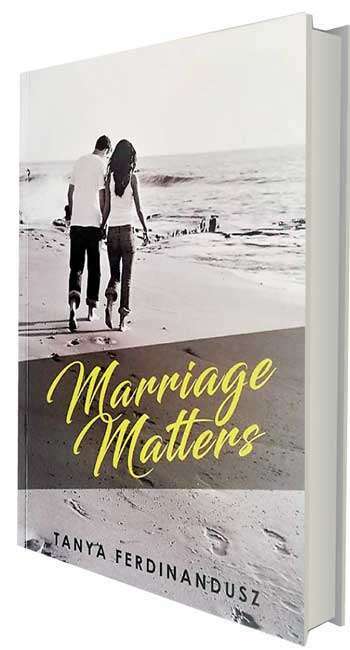 Covering a wide spectrum of issues that both enrich and bedevil our marriages, the book more than lives up to its name, rounding off each chapter with realistic ways couples can work biblical principles into their lives. Thirdly, the book is well written. Not all books on marriage are bad, but few are dressed in well-turned out language. Ferdinandusz bucks the trend. Her writing is winsome and illustrations hit the mark, speaking not only to our heads but our hearts. In many different levels, she engagingly reminds us that in this most fundamental of human relationships, ‘marriage matters’ do matter. Get them wrong and our families and our world will reap the consequences. But get them right and we stand to reap the rich harvest that follows. This book will help marriages produce a bumper harvest. And fourthly, the book is tested. It isn’t just theory. It comes from the author’s own experience of 25 happy and healthy years of marriage that has learned its lessons in real time, and built an enduring relationship of great value. Its counsel that needs hearing and a book well worth dipping one’s feet into many times through the year. ‘Marriage Matters’ will also be a useful wedding or anniversary gift. It is published by ‘Back to the Bible’ and is available at their bookshop at: 120/A, Dharmapala Mawatha, Colombo 7.